Skunks are usually a nuisance to homeowners by inhabiting the underside of a person's deck or patio. We set effective skunk traps by utilizing "positive sets" when dealing with a skunk under a deck or patio. By this we mean setting traps so that the skunk has no choice but to go inside the trap once he exits the deck/ patio. Occasionally positive sets are impossible to set because the siding on the deck is not enclosed. These are the decks that need/should have a skunk exclusion performed, which we will explain further into detail once you call us on our business phone. Or continue reading and we will get into that too. More detail on the positive sets - if there is a hole around the edge of the deck or patio that the skunk is utilizing to go in and out, we will take a cage trap, put plywood boards around it, and then stake these boards so they are held in a secure position. When the skunk comes out of the entrance, he cannot climb over the plywood due to the fact skunks are horrendous climbers. They even fall into window wells and cannot get out for pity sake! Anyways, due to the skunk not being able to climb over the plywood, it will have no choice but to go inside our live cage trap. This is very effective and generally quick means of skunk removal that we utilize quite frequently because of the effectiveness. Skunk Removal is a common service we provide to homeowners and businesses across Central Ohio in the cities of Dublin, Powell, Hilliard, Marysville, Delaware, Columbus, Bexley, Worthington, Westerville, Grove City, and Upper Arlington Ohio. 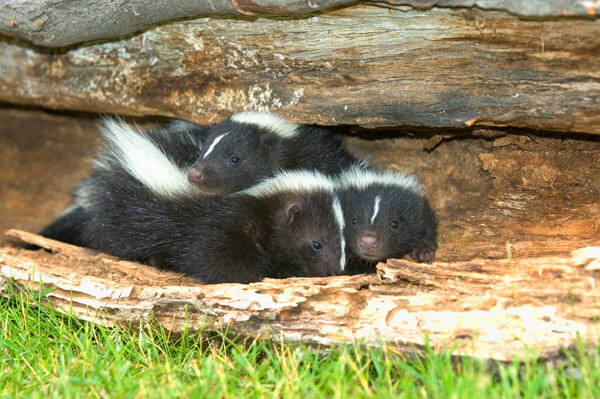 Skunks will dig entry holes underneath your deck or patio searching for a good place to build a nest so they can birth their skunk kits in the spring time. Skunk removal can be a risky process for those who are unexperienced. The skunk may spray if you are not careful while approaching the skunk trap. You must be able to recognize when the skunk is threatening to spray. When a skunk is "threatening" you, the skunk will begin stomping his front feet. Once you approach a little closer, an aggressive skunk will turn around and stick its striped skunk tail straight in the air. This is when bluffing comes into play. Some skunks are serious, and others are not. We might walk up to that trap, cover it, and be completely fine & remove the skunk from the property without an issue. This is the most common case. However, other skunks that are more defensive might blast us if we take another step forward after he turns around with his tail up. We have learned the hard way how to differentiate a skunk that is bluffing, and a skunk that is not bluffing. Its hard to explain. Its something you have to actually experience in order to understand. Sometimes taking a water hose and spraying an aggressive skunk is effective because it distracts the skunk from focusing primarily on us. Buckeye Wildlife Solutions also offers the service of skunk exclusion. "skunk exclusion" meaning we can take wire & other material to seal off the areas where skunks could potentially utilize for a nest around your home. These areas are usually around the deck or patio. The skunk exclusion process comes with a warranty ensuring that your property will be skunk free for a long time. We do a "skunk exclusion" by taking hardware wire, digging 6-8 inches into the ground, and then staking the wire down so no animal can pull or dig it up out of the ground. We ensure that this is a quality process. We are confident in providing the homeowner who had skunk problems with a warranty. The statement on a skunk exclusion warranty shall be "free skunk removal if the skunk returns and uses an entrance where Pestco Wildlife had performed a skunk exclusion on that area." We are confident you will have no problems with skunks after we are finished with the process, that is why we guarantee free skunk removal if it fails! 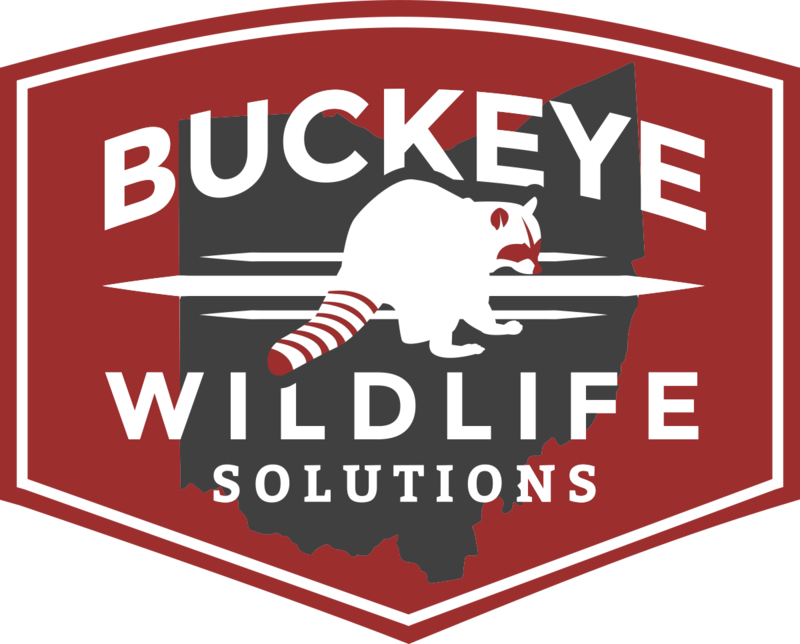 Buckeye Wildlife Solutions skunk removal - Ohio's best! We at Buckeye Wildlife Solutions provide the best service you can find for skunk removal due to the fact we use heavy duty traps that are meant specifically to trap and remove skunks and we are complimented on our excellent customer service from clients of ours on a regular basis in the Ohio cities of Dublin, Powell, Hilliard, Marysville, Delaware, Columbus, Lewis Center, Worthington, Westerville, Reynoldsburg, Bexley, Valley View, and Upper Arlington Ohio. An important factor in trapping and removing skunks around Dublin, Powell, Hilliard, Marysville, and Delaware Ohio is using the proper bait and lure to attract the skunks. We have done extensive research on the topic of using lure's for skunks and we have found skunks prefer things that are sweet smelling. Peaches N Cream is one of my personal favorite skunk lures. We have trapped and removed many skunks around Columbus, and we have used methods where we have seen the evidence of lure effectiveness. 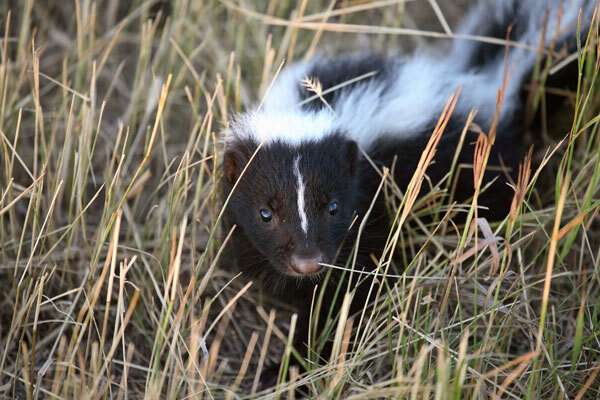 If a skunk has sprayed your cat or dog, we can provide the service of deodorizing your property and even helping you scrub our special solution into your pets fur. If you would like to do it yourself, our remedy is filling a bucket with a gallon of water, adding a splash of dish soap, a tablespoon of baking soda, and a quarter cup of hydrogen peroxide. Scrub Solution in your cat or dogs fur at least 5-10 minutes and it should significantly reduce the skunk odor from the pets fur. 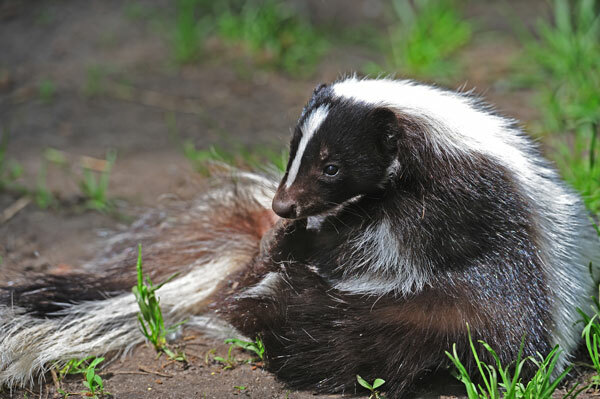 Skunk odor is very repulsive, and not something you want to wake up smelling on the interior of your home. Call Buckeye Wildlife Solutions today for skunk removal / control services in the Ohio cities of Dublin, Hilliard, Powell, Lewis Center, Worthington, Westerville, Columbus, Delaware, Marysville, Reynoldsburg, Plain City, Raymond, Richwood, Union County, Delaware County, Marion County, Franklin County, and the rest of Central Ohio around Columbus, Ohio. Control and removal of skunks can prove to be a little tricky at times, you just have to know how to approach a skunk when its captured in a live cage trap. It takes experience, and maybe a little guts, but we have successfully removed many skunks around these greater Columbus Ohio areas and have managed to avoid being sprayed on a consistent basis. Yes, it has happened before unfortunately. Skunks also fall into homeowners window wells every now and then and cannot climb back out due to the fact that skunks are terrible climbers. It is a good idea to get these window wells covered with some type of cover/ material that will prevent a skunk from falling into these window wells again. Call Buckeye Wildlife Solutions for skunk removal in Columbus, Dublin, Powell, Hilliard, Upper Arlington, Worthington, New Albany, Bexley, Granville. We will approach the skunk and put a snare pole around it and then put it into one of our live cage traps. Believe it or not, this can be done without being sprayed. The trick is to just be very gentle when lifting the skunk up, and taking certain precaution to cover the skunks eyes with a towel or rag so the skunk cannot see us. Skunk Removal in Dublin, Powell, Hilliard, Marysville, Delaware, Lewis Center, Worthington, Westerville, Plain City, Columbus and Upper Arlington Ohio is one of our favorite jobs. Controlling skunks is done so at a high success rate ensuring that your skunk problems are eliminated for good.